Bring a professional art handler means to be able to handle, pack, and ship art of any kind. Besides, a good art handler should be able to appreciate art in all its many forms, providing every single piece with care and attention it deserves. This is exactly what we offer at Fine Art Shippers! After all, shipping fine art is more than just our business – it is our passion and an integral part of our everyday lives. Moreover, we love to work with talented artists and dedicated dealers, helping them spread contemporary art around the world. For example, let us introduce a truly unique work with a shocking story behind it. Pak Yeong Cheol is, without a doubt, a very talented artist from the Democratic People’s Republic of Korea that is commonly known as North Korea. 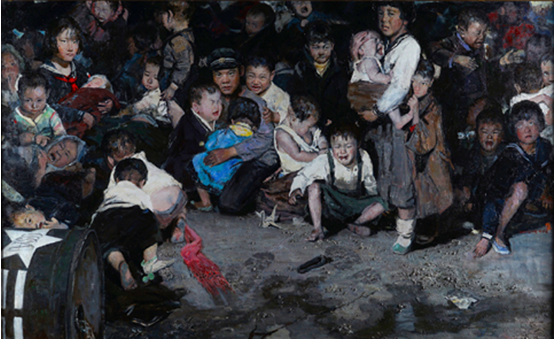 His impressive painting “The Night Before the Death of 102 Children” depicts a mass murder that took place during the Korean War when 102 children of all ages were burned alive in the town of Sinchon, North Korea. It took the artist more than two years to complete this work that perfectly shows the inner world of the children before their death. A tragedy that should not be forgotten! 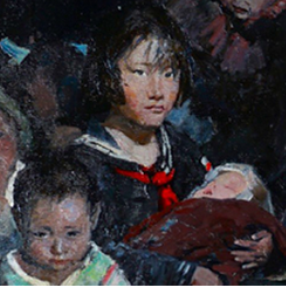 North Korean art is indeed unique, and it is undoubtedly an interesting experience for any art handler to ship a painting like this masterpiece by Pak Yeong Cheol. We are very thankful for the chance to get acquainted with such an important artwork!